Kansas Builds Memorial to DUI Victims. Help Them Do More. Home » Kansas Builds Memorial to DUI Victims. Help Them Do More. The first Kansas memorial to DUI victims was unveiled recently in Ellsworth County. 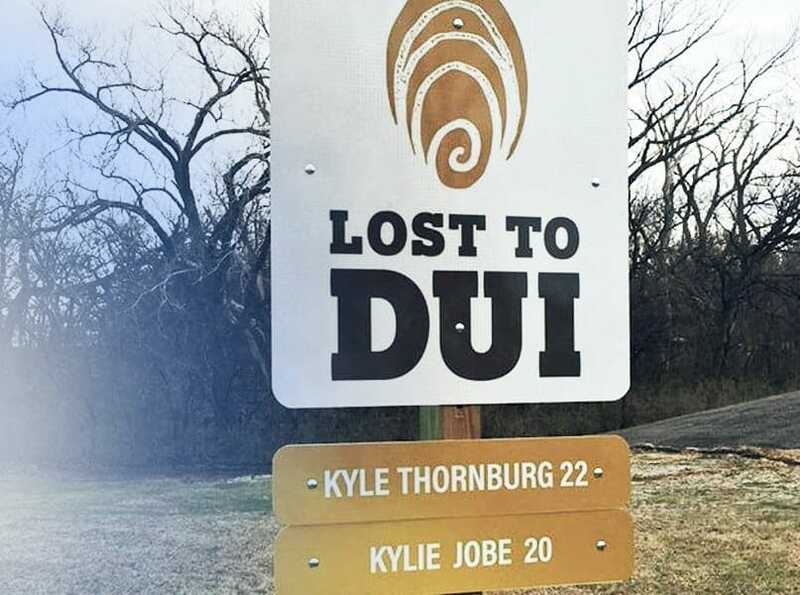 It’s a sign with the words “Lost to DUI” and the names of two high school sweethearts, Kyle Thornburg, and Kylie Jobe. They were returning from a ski trip in 2011 when they were hit head-on by a drunk driver and killed. The names and ages of the victims are on the sign, a reminder that drunk driving is a scourge that interrupts and steals the lives of real people. The sign is a direct result of the Kyle Thornburg and Kylie Jobe Believe Act, which went into effect in July of 2016. Under that law, family members of a person lost due to DUI may request a memorial marker. The law intends to make the effects of drunk driving real to everyone on the roads of the state. Too often DUI deaths are related in the form of statistics, numbers which, while disturbing, do not have a life of their own. It’s tragically apparent that Kyle and Kylie did have a life of their own, and deserved to see it through to old age. Thanks to the decision of someone to drink and drive, it never happened. The signs will serve as a constant reminder of the consequences of that bad decision. There is another memorial that anyone concerned about DUI should be aware of: laws that keep drunk drivers off the road. They include laws which restrict alcohol availability, promote sobriety courts as an alternative to prison, and increase alternative transportation. Road safety advocates have produced research which shows that the laws work. Ignition interlock laws are a vital measure that must be in the mix too. An ignition interlock, or car breathalyzer, prevents a vehicle from starting if the driver has been drinking. Kansas mandates ignition interlocks for all offenders, which is an excellent start. Kansas could improve its road safety by making ignition interlocks available to all first offenders upon arrest, instead of just after a conviction. That’s a measure that is shown to reduce the number of alcohol-related collisions and DUI victims. The state could also enact compliance-based removal: the device would only be removed after the offender was able to pass a certain number of months without a failed breath test. The state of Kansas and the people who pressed for the Kyle Thornburg and Kylie Jobe Believe Act should be commended for helping to make more people on the road aware of the devastation that drunk driving wreaks on families, friends, and society. We hope that legislators take the message on those signs to heart, and strengthen the laws that might someday make those signs unnecessary. Governor Signs a Nice, Tight Kansas Ignition Interlock Law.